A memorable gift, a nice reminder, or just something to keep your keys on. 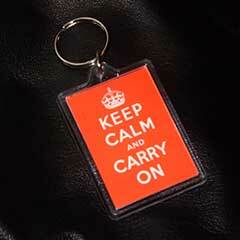 These double sided key rings allow you to take a little bit of history with you wherever you go. 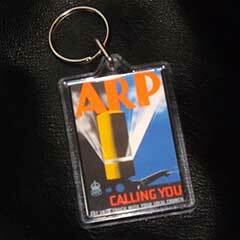 This double sided key ring (Image both sides) depicts an ARP poster from the Second World War. A lovely gift for an enthusiast or art lover. A full size copy of this poster is also available in the poster section). 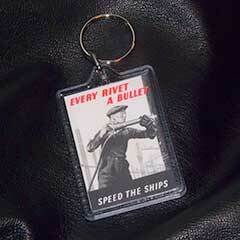 This double sided key ring (Image both sides) depicts this well known poster from the Second World War. A lovely gift for an enthusiast or art lover. A full size copy of this poster is also available in the poster section). 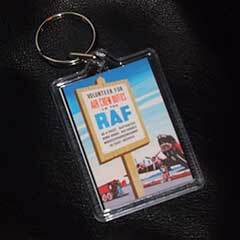 This double sided key ring (Image both sides) depicts an RAF recruiting poster from the Second World War. A lovely gift for an enthusiast or art lover. A full size copy of this poster is also available in the poster section). 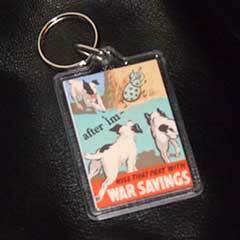 This double sided key ring (Image both sides) shows the Squander Bug being chased by dogs in this war savings poster from the Second World War. A lovely gift for an enthusiast or art lover. A full size copy of this poster is also available in the poster section). 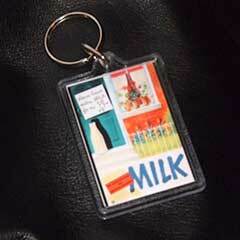 This double sided key ring (Image both sides) reproduces a ministry of food poster which stresses the importance of milk. A lovely gift for an enthusiast or art lover. A full size copy of this poster is also available in the poster section). 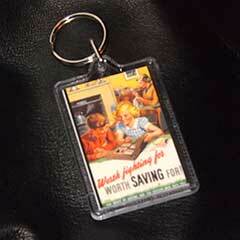 This double sided key ring (Image both sides) shows two children who are helping the war effort by putting their money into saving stamps. A lovely gift for an enthusiast or art lover. A full size copy of this poster is also available in the poster section). 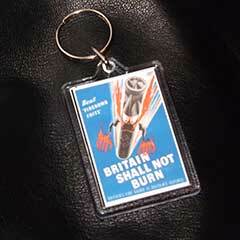 This double sided key ring (Image both sides) warns of the dangers of the incendiary bomb. A lovely gift for an enthusiast or art lover. A full size copy of this poster is also available in the poster section). 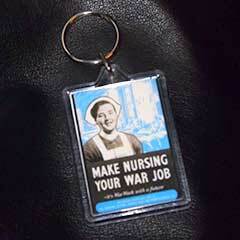 This double sided key ring (Image both sides) reproduces a recruitment poster for nurses. A lovely gift for an enthusiast or art lover. A full size copy of this poster is also available in the poster section). 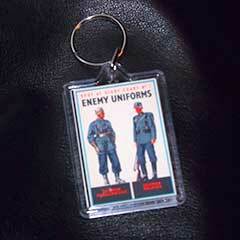 This double sided key ring (Image both sides) shows the general public how to spot a German uniform. A lovely gift for an enthusiast or art lover. A full size copy of this poster is also available in the poster section). 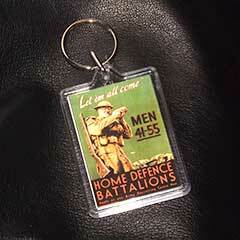 This double sided key ring (Image both sides) shows a poster recruiting for Home Defence Battalions. A lovely gift for an enthusiast or art lover. A full size copy of this poster is also available in the poster section). 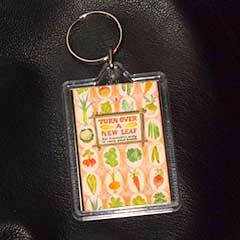 This double sided key ring (Image both sides) shows a lovelly poster encouraging the growing and eating of vegetables. A lovely gift for an enthusiast or art lover. A full size copy of this poster is also available in the poster section). 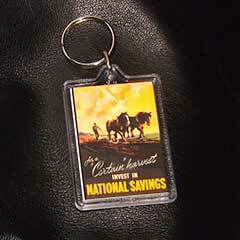 This double sided key ring (Image both sides) shows an beautiful country scene with the plea to invest in National Savings. A lovely gift for an enthusiast or art lover. A full size copy of this poster is also available in the poster section). This double sided key ring (Image both sides) tells how everyone is doing their bit for the war effort, especially those working in industry. A lovely gift for an enthusiast or art lover. A full size copy of this poster is also available in the poster section). 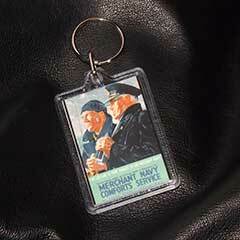 This double sided key ring (Image both sides) advertises the Merchant Navy Comforts Service. A lovely gift for an enthusiast or art lover. A full size copy of this poster is also available in the poster section). 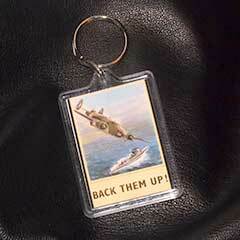 This double sided key ring (Image both sides) shows the capture of the German submarine U 570 by Lockheed "Hudson" of the British Coastal Command.. A lovely gift for an enthusiast or art lover. A full size copy of this poster is also available in the poster section).